The television show Mythbusters is one of the most popular science shows on television, and it uses a lot of physics! I would often watch the show and eagerly look forward to the myths being tested. After I began watching it, it soon became obvious that the myths usually involve physics of some sort, especially classical mechanics in which there's motion and forces involved (such as when blowing things up). One can have a lot of fun trying to analyze the physics behind some of the myths that are tested. One of the myths that was tested on the show is: Is running better than walking to keep dry in the rain? It turns out you can analyze this myth in a fairly straightforward manner, and in this newsletter I will do just that. 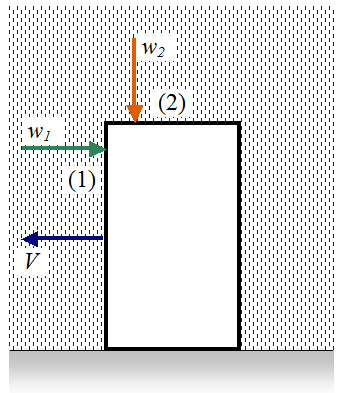 First, model a person (moving through the rain) as an upright rectangular box moving through the rain at speed V as shown. 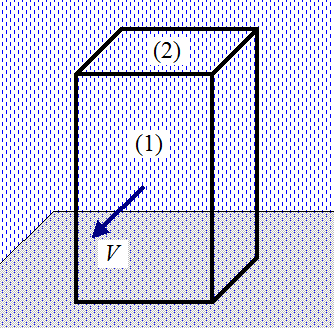 The surface (1) represents the front of the person and the surface (2) represents the top of the person. The figure below shows a side view of the set up. Let w1 be the rate of rain impingement on the front of the person (given as volume of water per second). Let w2 be the rate of rain impingement on the top of the person (given as volume of water per second). If the person is standing still w1 = 0. If the person is moving then w1 ≠ 0. The faster the person moves (at greater speed V) the greater is w1. The rate w2 is always the same whether the person moves or not. The rate w1 is proportional to V. Mathematically this means that w1 = aV, where a is a constant. Now, T = d/V, therefore A1 = w1(d/V) = aV(d/V) = ad, which is constant. Now, the total amount of water impinging on the person is A1 + A2, where A2 is the amount (volume) of water impinging on the top of the person, and A2 = w2T. Since A1 is constant, then to minimize getting wet we must minimize A2. Since w2 is always the same no matter what V is, then to minimize A2 we must minimize the time T spent in the rain. Therefore to minimize getting wet the person must run as fast as he/she can to their destination. We are done! If you enjoyed this analysis you'll also enjoy the 48 page ebook I created which contains a physics analysis of many more myths tested on the show. You can find out more about this ebook on my mythbusters physics page.